Wonderfully decorated and handmade by artisans, this Limone Viola Italian ceramic pitcher will enhance your serveware collection. Made in the Umbria region in Italy, famous for Italian Majolica Ceramics and Pottery. This 1.5 Liter (48 oz.) 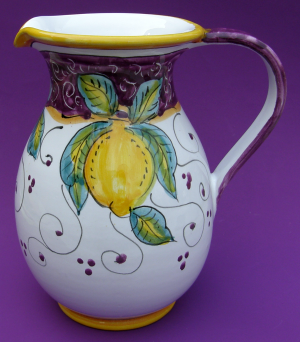 handmade hand painted authentic Limone Viola pitcher measures 7.75" in height.